The BIIA is administered by three full-time Board Members appointed by the Governor. Where do I find rules about appeals? Most of the rules can be found in the BIIA's Rules of Practice and Procedure. Statutes and rules can also be found on the Washington State Legislature website. Assign a docket number to the appeal. Mail a Notice of Receipt of Appeal to the parties. Send a copy of the appeal to L&I. Advise the BIIA that they will reconsider their decision. The BIIA has 60 days to decide whether the appeal will be granted. L&I must respond to the appeal within this time frame. What if L&I reconsiders its decision? The BIIA will return the appeal to L&I for further action. What if L&I does not reconsider its decision? The BIIA will decide whether it has jurisdiction (the right to hear the appeal). If the BIIA does not have jurisdiction, the appeal will be denied and an Order Denying Appeal will be sent to the parties. If the BIIA has jurisdiction, the appeal will be granted and an Order Granting Appeal will be sent to the parties. An Order Granting Appeal does not mean that anyone has won or lost the appeal. It only means that the BIIA agrees to hear the appeal. The law provides for continued benefits during an employer appeal. The law also allows the employer to request those benefits be stayed (stopped) by filing a motion within 15 days after the appeal is granted. The employer's motion should specifically request that benefits be stayed during the appeal process. This law does not affect appeals filed by injured workers. The BIIA will decide to grant or deny the motion based on only the information in the L&I file as it existed on the date of the order on appeal. New medical or vocational information in the file or offered by the parties in connection with the motion cannot be considered. If you did not file the appeal, you may choose whether to participate in the conferences and/or hearings. If you choose not to participate, it is possible that your interests could be substantially affected by the outcome of the appeal. In some instances, the outcome of the appeal might not have any effect on you. If you have an interest in the outcome of an appeal, you should participate in order to voice your opinion. Parties can represent themselves in an appeal before the BIIA, or they may be represented by an attorney or lay representative (non-attorney). Lay representatives for injured workers or crime victims may not charge a fee or otherwise be compensated. WAC 263-12-020(3)(a)(iii). L&I will be represented by a paralegal or an attorney from the Office of the Attorney General. What happens when an appeal is granted? After an appeal is granted, a mediation conference will be held in most cases. A mediation conference is an informal meeting of the parties with a mediation judge. All parties will receive a notice indicating the date, time, and location of the conference. The conference may be held in person or by telephone. Mediation is not a hearing—witnesses will not be called to testify. An attorney is not required, although the assistance of an attorney may be helpful. The mediation judge may schedule further conferences, if needed. In mediation, parties are able to discuss the appeal in a relaxed, confidential, and informal setting. If a settlement can be reached in mediation, the parties avoid the uncertainty, expense, and delay of a formal hearing. The mediator will discuss options for settling the appeal. The mediator will not decide the outcome of the appeal. The mediator can speak to parties privately. This process allows the mediator to meet separately with each party to explore settlement options. The mediator may look at the information supporting a party's position and may suggest what additional information may be necessary. The mediator cannot give legal advice but will answer questions about the process. What should I bring to the mediation conference? Look at the L&I decision that was appealed. Consider what it would take to settle the appeal. Gather all documents that support your position and bring them to the mediation conference. Don't bring originals. Instead, bring copies. Bring the Jurisdictional History. This is a summary of the history of the case. Be ready to discuss whether this history is correct. What happens if the appeal is resolved? The party that filed the appeal can voluntarily dismiss the appeal. The parties can agree on a settlement. The BIIA will then issue either an Order Dismissing Appeal or an Order on Agreement of Parties. 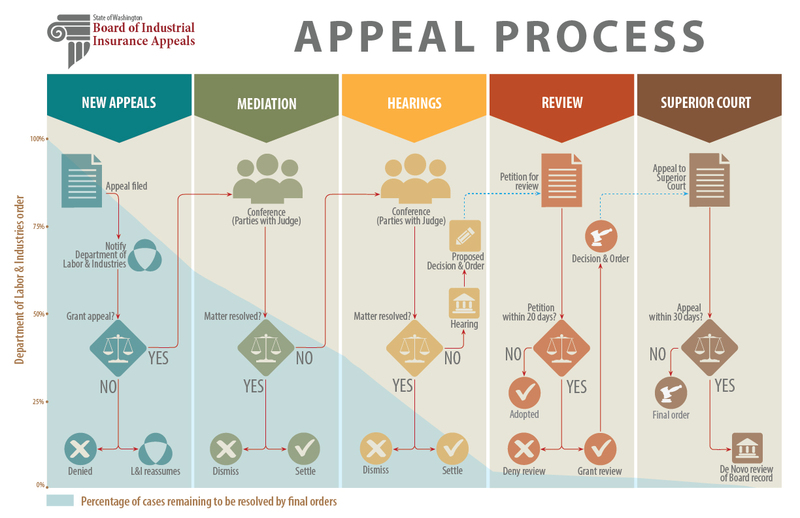 What happens if the appeal is not resolved? When a settlement cannot be reached, the case will be given to a hearings judge, who will schedule a formal hearing. To ensure confidentiality, the mediator is not allowed to discuss facts of the case with the hearings judge. What are the rules for BIIA hearings? BIIA hearings are like trials. The Rules of Evidence and Superior Court Civil Rules apply. Parties must be familiar with these rules in order to ensure that all their testimony and evidence will be admitted at the hearings. At this point, the appealing party should consider finding an attorney. An experienced attorney will represent L&I or the self-insured employer. An attorney can negotiate with the opposing parties, help obtain necessary witnesses, and make objections. What is the hearing judge's role? The judge assigned to the case can help question witnesses, but will not act as an attorney for the parties. The hearings judge must remain neutral and cannot discuss the facts of the case without all parties present. All parties will receive a notice indicating the date, time, and location of the hearing. The first hearing in a workers' compensation case is usually held either in the county where the injury occurred or the county where the worker lives. All evidence must be presented at the hearing. The evidence presented at the hearing will be the only basis for the decision at the BIIA or at a higher court. At the hearing, the parties will present their witnesses, who will testify under oath. All testimony will be recorded by a court reporter. In most cases, a doctor will be required to appear in person to testify. Doctor's notes and letters may not be received into evidence if a party objects to it. Each party is responsible for arranging for their doctors and other witnesses to testify, and for paying witness fees. In workers' compensation, crime victims, and employer premium cases, the appealing party must present evidence first to show that L&I’s decision is incorrect. In a willful misrepresentation case, L&I or self-insured employer must present evidence first. When all hearings are completed and all evidence has been received, the hearings judge will issue a Proposed Decision and Order, which is the hearings judge's decision on the appeal.